Citric Acid, Malic Acid, Natural And Artificial Flavor, Calcium Silicate, Trisodium Citrate, Sucralose, Acesulfame Potassium, FD&C Blue 1. As a dietary supplement, mix 1 scoop of RECOVERMODE™ with 12-14 oz of cold water (vary amount of water by taste) immediately after training. Not for use by those with pre-existing medical conditions or taking any medications, those under the age of 18 or women that are contemplating pregnancy, pregnant or nursing. Keep out of reach of children and pets. Store at room temperature. Citric Acid, Malic Acid, Natural And Artificial Flavor, Calcium Silicate, Trisodium Citrate, Sucralose, Acesulfame Potassium, FD&C Red 40, FD&C Blue 1. 2,250mg Creatine Monohydrate: The most clinically studied form of Creatine. For performance and recovery, it's crucial to maintain electrolyte levels to support proper hydration and muscle contractions. 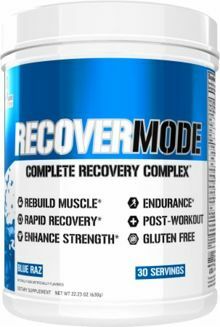 RECOVERMODE contains 1G Calci-K/serving plus sodium and potassium to help your body hydrate and recover from intense exercise.